We get this question a lot: when you travel, what is the best way to travel with your dog? Our pups, like many of yours, are part of our family, so we don’t like leaving them at home. So when we decided to make a life of traveling, our dogs were a major consideration for us. Here is how we came to our decision to live in an RV in order to travel with our dogs. Where/how far are you traveling? Is this a vacation or a lifestyle change? How does your dog react to changes in lifestyle? Is your destination pet friendly? 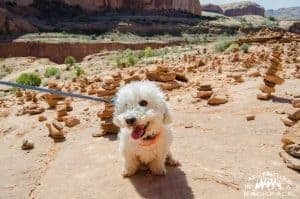 Now I’ll talk about all of these in much greater detail and discuss how we came to the conclusion of an RV as the best option for traveling with dogs long-term. 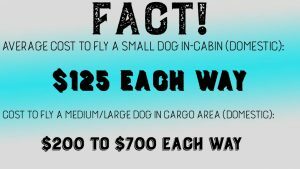 Depending on how far you are traveling, you will want to consider the pros and cons of flying a dog. It is stressful on them and you. If it's possible to drive, that is preferred! How far you are traveling is a major consideration when thinking about bringing your dog along. Whether you are going on a road trip to a neighboring state or traveling halfway around the world will take two very different sets of plans. If you are able to drive to your destination, it is a much easier travel plan than flying. This is a big reason why we decided to stay in North America and travel with our dogs via RV. Flying with pets can be very dangerous. Unfortunately, the airlines have not caught up with our society of animal lovers who want to bring their pups on adventures too. Our dogs (and cats and other pets) are part of our family, so putting them in a pet carrier in the cargo area just doesn’t sit well for most of us. Now, I totally understand that it can be done and it does happen often with no issues, but I still wouldn’t feel comfortable with my pup in a pet carrier in the cargo area of the plane, with all of that noise, all by herself (note: I’m referring to our Doberman, Pyros, as Sparta the Bichon would be small enough to ride in a pet carrier in the cabin of the plane). I can only imagine the stress that would put on her. 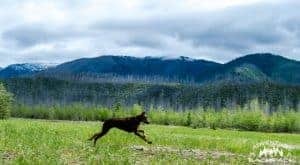 How long you will be gone on this trip is important to your decision for traveling with dogs for many reasons. First, if you are going to be gone for months, your dog will react differently to being left at home than if it is just a week or two. Secondly, where your dog will be able to stay while you are traveling will be another consideration for timeframe. This could be a pet hotel, a pet sitter, a kennel, or a friend. For shorter vacation trips, consider hiring a house/pet sitter to come and stay with your pet in your own home. 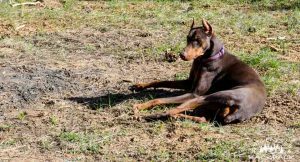 There are lots of great sites that verify credentials and backgrounds, and it makes the pups feel much better about you being gone when they are in their own home. When thinking about a pet sitter or kennel versus bringing your dog on vacation, you will also want to consider the cost. The longer you are going to be gone, the more the cost of leaving your dog at home goes up (assuming you are paying for accommodations). But the cost of an airline ticket for a dog is not cheap either. So there is one more thing to consider for you when traveling with dogs! This whole conversation is different depending on if this is a lifestyle change versus a vacation. When we decided to move into an RV, we were moving for the long-term. We rented out our house, so there was nowhere to come back to for us. So choosing an RV for us made sense because it was easier to travel about the country and move around a lot without stressing the dogs out too much. They still have their “place” in our house (RV), and they have adjusted quite well. Choosing the RV lifestyle was a great option for our family, as it is comfortable for the dogs as well. Sparta LOVES hanging out looking out the window! 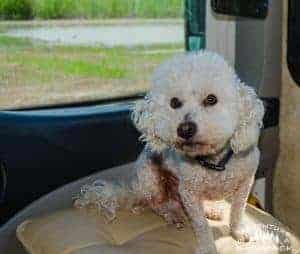 If you are going on vacation and want to bring your dog along, I highly suggest renting an RV, if you don’t have one (and if you are in the market for one, give our friends over at Transwest a call). Taking your dog along with you on an airplane, for all of the above mentioned reasons, is very stressful and difficult on both you and the pup for just a week or two long vacation. RVing has been the best decision for us for traveling with dogs! Traveling with dogs is stressful on both the owner and the dog! 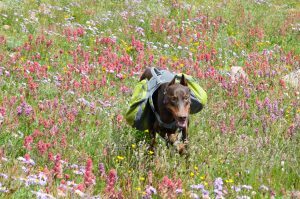 There are many changes to normal vacation plans that need to be considered when traveling with dogs as opposed to traveling without dogs. But stressing out the dog unnecessarily is a big red flag for us. We have two dogs with two very different personalities. On one hand, we have Pyros who is a big bad Doberman who is afraid of cardboard boxes. She is friendly and loving, but shy and sometimes skittish. On the other hand, we have the fearless Sparta (the Bichon), whose only fear in life is not getting more dinner! Making sure your pooch is happy and healthy is the number one concern. Don't stress them unnecessarily! So when we think about traveling with our dogs, our biggest fear is always Pyros getting stressed out. 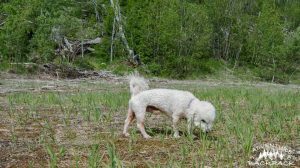 We don’t like to put her under any undue stress, obviously, but she still loves adventures. So would I take her on a plane to South America for a trip of hiking and climbing? Probably not, because of the plane ride. Would I take her hiking and climbing in the Rocky Mountains? Hell YES! She loves that stuff! And that’s why we take her in the RV! 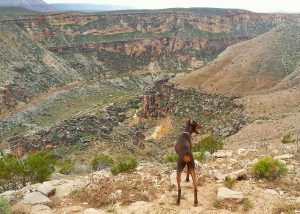 Pyros loves hiking and exploring, but isn't a fan of loud noises. She is enjoying our lifestyle choice! 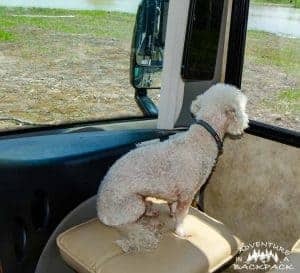 We did have an adjustment period when we first moved into our RV, both for us and for the dogs. It took Pyros a few tries before she realized that when the walls started moving, we weren’t all going to die (the slides on the motorhome freaked her out, understandably)! She also took some time to get used to the squeaks and bangs of stuff moving around while we are on the road. But eventually, she came to understand that this was home. She has her place on the floor where she rides, and she loves the life of adventure! Now there’s Sparta, too! He is little King of the Road! He enjoys sitting on my (Steph) lap or on the ottoman up front while we drive so that he can look out the window. He really enjoys the window being open and the wind on his face, but it’s pretty loud to drive with it open so he doesn’t get to indulge in that often. Otherwise, we leave one of the tall windows in the living area open for him and he sits behind one of the chairs to look out the window. It doesn’t take much to make him happy! This pup really loves this life! Both of the dogs have learned that as soon as we stop, it means we are in a new place! They immediately want to get out and sniff ALL the things!! Pyros enjoys smelling the fresh air in all of the beautiful places we see. She's getting used to the RV and loving the adventure! Ultimately, we know that both of our dogs are happier living in the RV than they ever were living in houses. They go on regular adventures, they get to sniff all kinds of things, and they get to meet new friends (birds don’t seem to want to be friends with Pyros, though…)! They have their spots that they lay during the day and they come and sleep in the bedroom in their beds at night. They know their routine and have been great about it. Some days they decide they don’t want to go on a hike, but that’s okay! They are allowed to rest and relax, too! But overall, they love this adventure-filled lifestyle. Of course, a big consideration when thinking about traveling with dogs is whether or not your destination is pet friendly! This is everything from pet friendly accommodations to vaccinations and quarantines needed for pets entering another country. Before you start thinking any further about traveling with dogs, make sure your destination will allow them to be safe and happy! 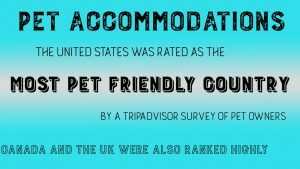 There are many dog friendly hotels and other accommodations throughout the world, but you definitely need to check before assuming such. Another consideration on pet accommodations is whether or not there is a good area to walk your dog regularly. If you are staying in a big city, you may want to look for dog parks in the area. If your hotel or other accommodations are pet friendly, you can always ask them ahead of time where the best place to take your dog for a walk will be. Stop often on long road trips to let your pup out and let them run. We like to wear out our pups with a long hike or bike ride before a long trip so that they sleep like babies during the drive. Just a few changes to your pet gear can make all the difference between a happy pooch and a stressed pooch! Whatever route you choose to go for traveling with dogs, just be sure they are safe and as comfortable as can be. You ultimately know what is best for your dog! If you have any questions or comments, feel free to leave us a note below! Be sure to subscribe to our blog below and check us out on Facebook, Pinterest, Instagram, and Twitter! Until next time, Live Vicariously! Great post! My boyfriend and I like adventuring with our pups as well. 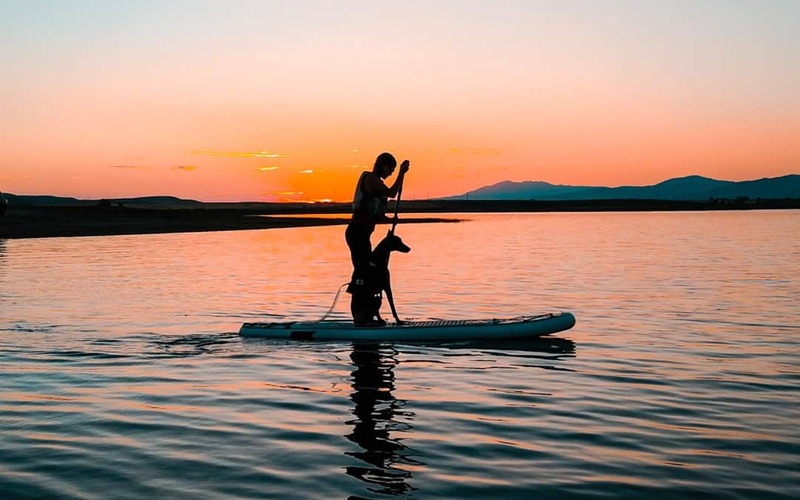 A couple of questions for you – when you guys are out on adventures (like the recent kayaking you did up in Glacier) – did the dogs stay in the RV while you did that? Do you leave any sort of generator on or is it generally cool enough to let them stay in there? Also, I live in southeast Denver and would be interested in your gal’s name who used to watch your pets! My email is below. Hey Lindsey! The pups do stay in the RV when we can’t take them along. We have an automatic start fan for them and always make sure temps are cool for them. RVs are insulated, unlike a car, so it’s usually actually cooler inside the RV than outside. With a fan and the windows open, they are nice and cool!